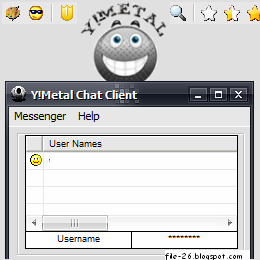 "Y!Metal Chat Client Version 2.1.3"
Y!Metal is a third party chat client that combines user-friendly design, advanced capabilities and all Safety Techniques for best chat experience in Yahoo!. Y!Metal provides the very best Anti-Boot protection - so chat isn't interrupted! Y!Metal covers ALL the bases; Booting, Locking, Spam, VC Lag/Beep & other Enhancements! This is the first program of its kind to be a pure native application.